Dhanteras gets even more special! India’s pride, nuclear submarine INS Arihant successfully completed its first deterrence patrol! I congratulate all those involved, especially the crew of INS Arihant for this accomplishment, which will always be remembered in our history. From PM Modi's twitter handle. In an era such as this, a credible nuclear deterrence is the need of the hour. The success of INS Arihant gives a fitting response to those who indulge in nuclear blackmail. Are its weapon systems with nuclear payload operational? Great to see the PM being involved in such details and announcing it with such pride! Since the PM himself has announced "deterrent patrol", there is no room for confusion. This was an announcement to the world by the highest authority of the country. What a day this Dhanteras is! Doesn't mince words, does he. A defining moment for our strat. deterrent. From now on a steady increase in capability and numbers of SSBNs must be our top priority . Darn it! Still no center-spread photos of the vessel to drool over! It has been 10 long years since she got pushed out! How accurate is that pic in the background? Seems as official as it could get with the PM himself in the foreground, but looks different from the 2009 launch pic (see the tapering hull in the front). arshyam wrote: How accurate is that pic in the background? Seems as official as it could get with the PM himself in the foreground, but looks different from the 2009 launch pic (see the tapering hull in the front). It is actually pretty much the same - that tapering down is the aft side, with a gentle hump for the launch tubes. would it would be carrying K15 with mithai on board/sub? What is with this whole hesitancy - the Prime Minister of India said it is back after first Deterrence patrol. You dont go to deterrent patrol with sticks of dynamite nor indulge in empty talk on something as serious as deterrent. Please! Arighat will look like a mini Borei with 8 tubes mashallah. hnair wrote: What is with this whole hesitancy - the Prime Minister of India said it is back after first Deterrence patrol. You dont go to deterrent patrol with sticks of dynamite nor indulge in empty talk on something as serious as deterrent. Please! Sabarimala and diwali arrests have brought down my happiness. But still good to know finally triad has been completed. also wasn't sure if the payload is mated on missile already or loaded prior to launch. A real Happy Diwali news for desh. Go Arihant. Admiral is missing when Mithai is due. Where are you admiral..? Speculation on what this deterrence patrol entailed can start. How long, where, route, comms, simulations, surveillance, assets deployed to protect the prized asset, costs, the enemy reaction (probably none for now) - means and methods, any war exercises done to challenge (unlikely), challenges faced - machine, crew and systems. C4ISR being tested to its zenith. Do not expect to "know" these answers but maybe after many years and decades nuggets will shed light but in the meanwhile, it would be interesting to speculate and dig if enquiring minds want to know. Will start with the most easiest one. Since the asset on board is the K15, it would have necessarily sailed from INS Varsha to striking ranges of key targets on the west, probably avoiding the shipping lanes and the Palk Strait. Duration around 90 days. Probably never surfaced for the entire route. Hopefully, some key lessons have been learned and the learnings shared. It would be interesting to speculate the route and the holding areas used. Most of it will be classified but chain of command was tested. Main priority should be to build reactors capable of propelling 14 15k T SSBN and SLBM with 8000 km range. https://twitter.com/SandeepUnnithan/sta ... 3689237504 ---> Arihant model + cap. "In an era such as this, a credible nuclear deterrence is the need of the hour. The success of INS Arihant gives a fitting response to those who indulge in nuclear blackmail." 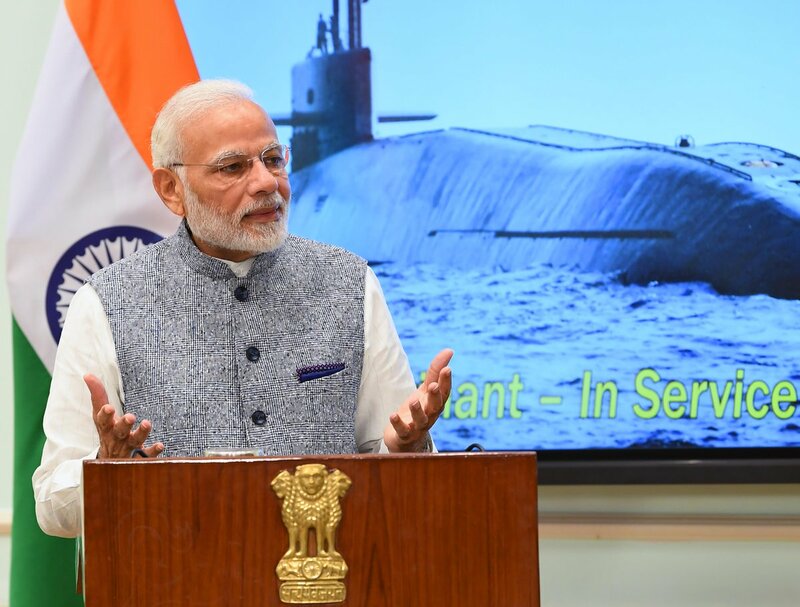 "As a responsible nation, India has put in place a robust nuclear command and control structure, effective safety assurance architecture and strict political control, under its Nuclear Command Authority." naruto wrote: ^^^ There are humpback whale (INS Arihant pics) behind PM Modi, I don't know how to share them. Somebody please do it. Rare closeup of Arihant. Unusual aft section, reveals Borei design influence. 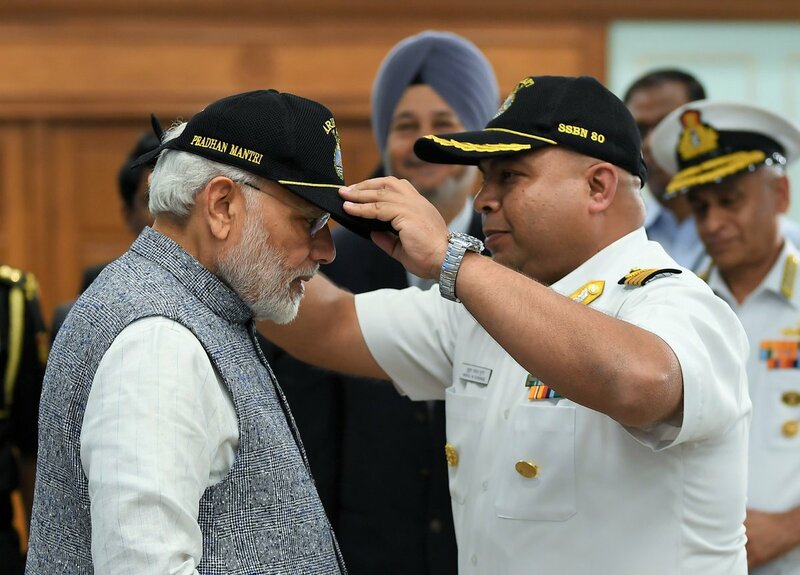 The naval officer placing the cap on Prime Minister Modi is Captain Mukul Surange. Last year he was the CO of INS Satavahana - the submarine training base of the Indian Navy at Visakhapatnam, Andhra Pradesh. 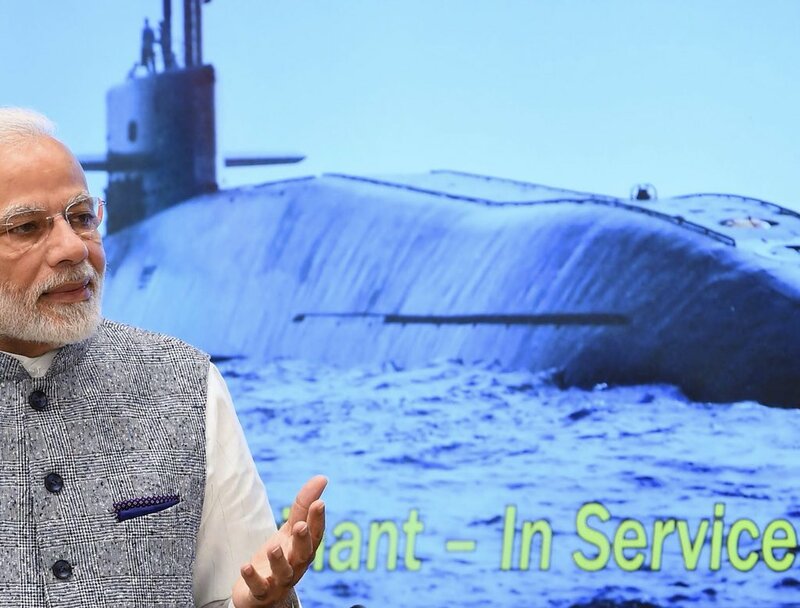 Today, he is the CO of INS Arihant SSBN 80.
https://twitter.com/narendramodi/status ... 3579124736 ---> Dhanteras gets even more special! India’s pride, nuclear submarine INS Arihant successfully completed its first deterrence patrol! I congratulate all those involved, especially the crew of INS Arihant for this accomplishment, which will always be remembered in our history. 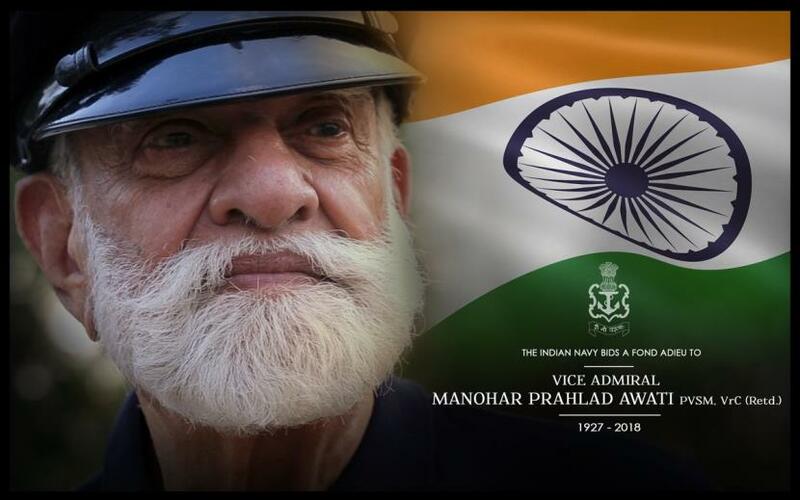 The Indian Navy (and India) lost an icon - Vice Admiral Manohar Prahlad Awati, PVSM, VrC, (Retd). I would like to believe that he has joined Varuna to watch over the Arihant (and her sisters) on her deterrence patrols. Shano Varuna! VIDEO: https://twitter.com/ANI/status/1059370255254867968 ---> Prime Minister Narendra Modi addresses the crew of INS Arihant which returned from its first deterrence patrol. This news is Diwali time!!! Kudos to India. A great day for the country.